I am an historian, an American historian. This Document is the most sacred of our brief history as a nation. I believe every American -- any lover of freedom, actually -- should read this at least once each year, to remember what was done and why it was done. The men who authored and signed these daring words were not perfect. They didn't actually believe "all men are created equal." Yet, I truly believe their hearts were in the right place. It is the spirit of this Document that I love; I can overlook the frail humans who blundered its execution. These brave men signed their own death warrants when they signed this Document. The least we, their descendants, can do is honor their courage and sacrifice by honoring this Declaration of Independence. Happy Independence Day! We hold these truths to be self-evident, that all men are created equal, that they are endowed by their Creator with certain unalienable Rights, that among these are Life, Liberty and the pursuit of Happiness. � That to secure these rights, Governments are instituted among Men, deriving their just powers from the consent of the governed, � That whenever any Form of Government becomes destructive of these ends, it is the Right of the People to alter or to abolish it, and to institute new Government, laying its foundation on such principles and organizing its powers in such form, as to them shall seem most likely to effect their Safety and Happiness. Prudence, indeed, will dictate that Governments long established should not be changed for light and transient causes; and accordingly all experience hath shewn that mankind are more disposed to suffer, while evils are sufferable than to right themselves by abolishing the forms to which they are accustomed. But when a long train of abuses and usurpations, pursuing invariably the same Object evinces a design to reduce them under absolute Despotism, it is their right, it is their duty, to throw off such Government, and to provide new Guards for their future security. � Such has been the patient sufferance of these Colonies; and such is now the necessity which constrains them to alter their former Systems of Government. The history of the present King of Great Britain is a history of repeated injuries and usurpations, all having in direct object the establishment of an absolute Tyranny over these States. To prove this, let Facts be submitted to a candid world. We, therefore, the Representatives of the united States of America, in General Congress, Assembled, appealing to the Supreme Judge of the world for the rectitude of our intentions, do, in the Name, and by Authority of the good People of these Colonies, solemnly publish and declare, That these united Colonies are, and of Right ought to be Free and Independent States, that they are Absolved from all Allegiance to the British Crown, and that all political connection between them and the State of Great Britain, is and ought to be totally dissolved; and that as Free and Independent States, they have full Power to levy War, conclude Peace, contract Alliances, establish Commerce, and to do all other Acts and Things which Independent States may of right do. 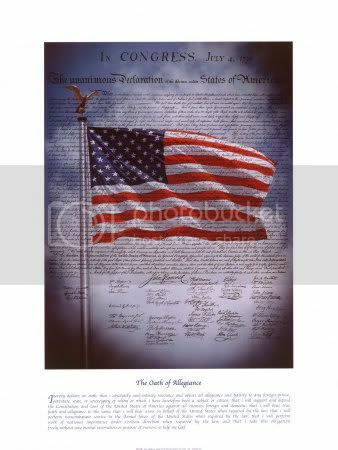 � And for the support of this Declaration, with a firm reliance on the protection of Divine Providence, we mutually pledge to each other our Lives, our Fortunes, and our sacred Honor. That was pretty good. Did you write that? Weren't the colonists' problems caused primarily by Parliament, and not the king? For the most part, yes. However, I believe the king was used as the embodiment, the source, of all the grievances. For more than a decade, appeals had been sent directly to the king, asking that he intervene with Parliament/the P.M. on the colonists' behalf. So, if he refused to help and, in fact, insulted the colonists by suggesting they weren't worthy of a hearing, it was the king, the symbolic final arbiter, who was addressed and rebelled against. Plus, historically, one big target with a crown is a lot easier to rail against than a bunch of guys in wigs who go home to the country every other week. I mean, look at our current system. I thought Bostonians were angry their harbor didn't perpetually taste like Earl Grey? I really don't understand American history. Not surprising. I don't believe anyone living in D.C. understands American history. Just sayin'. And, I believe it was PG Tips, not Earl Grey. Dude, what does P-FUNK have to do with it? what a sad state of affairs when even the Declaration of Independence is relegated to the politics section. I simply wasn't certain where to put this, so I picked politics. I kinda flipped a mental coin. Maybe next year, I'll put it in "weird news."